​Welcome to our Lodge, we are located in the old Cherokee Village of Aquone (where the two waters meet); on your travels here, you will experience a winding drive to the top of Nantahala Mountain where you will arrive in the wonderful area of the Nantahala Community, NC. close by the Lake you will discover a hidden gem known as Nantahala Mountain Lodge Bed & Breakfast, this is where all types of outdoor enthusiasts spend their weekends and vacations. At reception our staff will we greet you and assist with backpacks, boots and hiking poles and help you to our dedicated mud-room. You will be escorted to your room and shown around the Lodge and offered complementary tea or coffee. The Lodge is a large authentic log cabin located in the epi-center of all the outdoor activities (google Map). You will find located in the main sitting lounge our Wi-Fi, system and free long-distance calling. Our numbers are small for a reason, it allows our guests to sit and dine in comfort; (where all types of outdoor enthusiasts meet as strangers & usually become good friends). The cabin is located minutes from Nantahala Lake which has a lakefront restaurant, Marina, (boat hire is available), Gas Station and a Bait & Tackle store. All the outdoor activities which include; whitewater rafting, zip-lining, fly and freshwater fishing are all a short drive away. We are central to the access points of both the Appalachian Trail and Bartram Trails which run through the Nantahala area, and offer daily shuttles services. The Whitewater put-in point is just 8 miles away, where there are several choices of rafting equipment for hire. You can call in advance and reserve your room, shuttle service and your hiking guide (when available). Steve & Dan are Thru-hikers from 2010 (Syke Brothers)﻿ (Wiggy & Sticks). We offer up-scale accommodation, exceptional cleanliness, a clean change of clothes, laundry, free Internet service, free long distance phone service an assisted hiking package & shuttles to and from the trail. 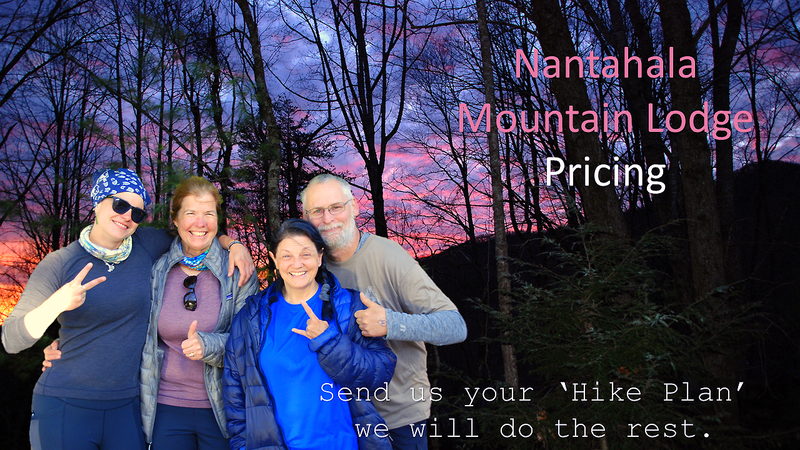 Our numbers are small for a reason, you get a one on one service with Steve or Maggie who have an abundance of knowledge of the trail and will do all they can to get you from Wallace Gap 106 to the Fontana Dam 166 For further details click the A.T. option above.